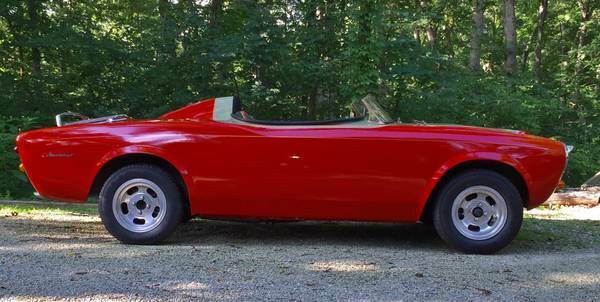 Vintage Fiat roadsters are common enough that their appearance on the streets or in the classifieds rarely raises an eyebrow. If you want your Fiat 124 to stand out, you will have to go to drastic measures. Here is one way of doing just that. 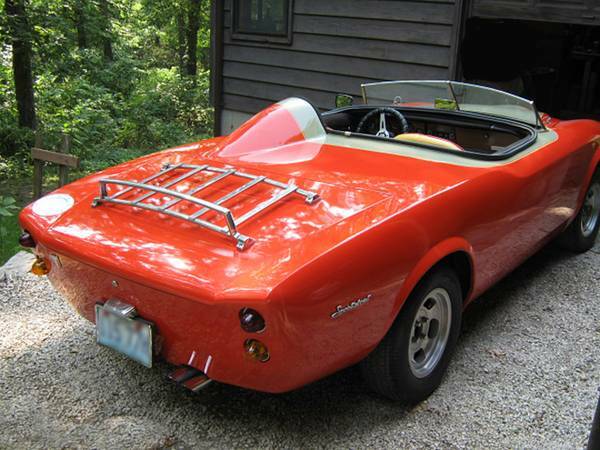 Find this 1972 Fiat 124 Spyder custom for sale in Villa Ridge, MO for $5,000 via craigslist. This conversion looks to be some kind of factory built kit. While the design starts out with smooth lines, things start going horribly wrong in a big hurry after that. The word tacky comes to mind with almost every other styling cue. You might get some confused looks from bystanders, but probably not the longing gazes you would get while cruising in a XKE or DB4. 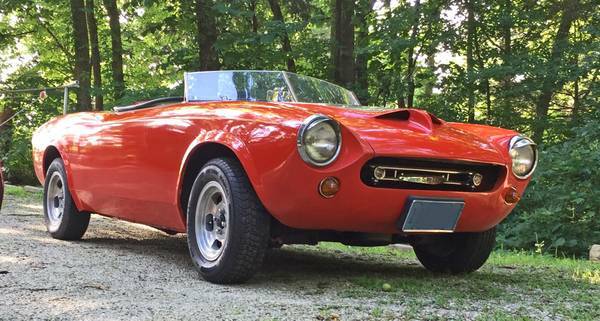 The Spyder embroidered seats and alloys are not helping matters, either. If you like piña coladas and getting caught in the rain, you are going to love this car. Gone is the convertible top that once kept some of the rain out of your face during an unexpected deluge. Everyone knows that doors sacrifice the structural integrity of a high quality race car, so those have been removed, too. We can only assume that there is a sturdy tube frame where they used to be. Other features include a wonky bird-nostril hood scoop and a luggage rack. 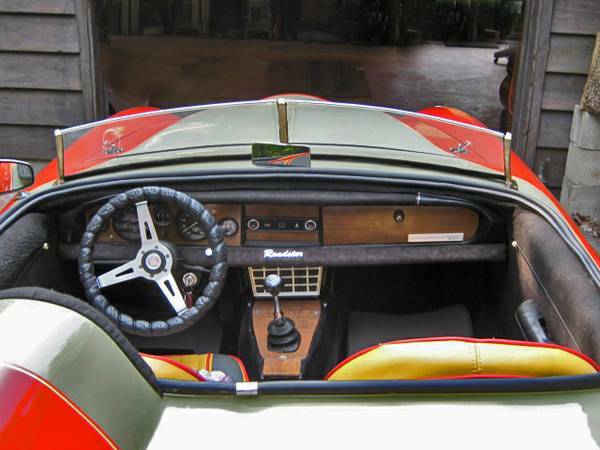 The word "Roadster" is writ large in the center of dash in case you thought you were in a station wagon after vaulting yourself into the cabin. Whatever this car was supposed to be, it succeeded in being weird in an almost creepy way. And that's tough to pull off. I've seen worse - though those seats! Just because you can copy something in wood doesn't mean that you should. Sigh. There's a good foundation to build on with this one. The concept is good, it just needs refinement. At the asking price, it can be done without too much total investment. Start with swapping the wheels and tires to something more Italian (maybe even stock Fiat) and lowering the stance a little. Tighten up those wheel opening gaps. You can make some $ back by selling the mags. Then simplify whatever is going on in the grille opening. A slotted grille or mesh would improve the front end. Next, remove all of the extraneous badges and the luggage rack if possible without leaving behind holes or damage. Eventually, redo the seats in simple black, but seat covers will do the trick on the cheap in the meantime. If the budget allows, the hood scoop should be simplified or removed, but that could lead to needing a repaint. Best option would be to find a parts car Fiat and use its hood, trunk lid, seats, and wheels. If the panels don't match, you could vinyl wrap them (maybe in flat black for the Abarth look, see below). I think the weirdest part of this whole car is the tall rubber weatherstrip seal around the cockpit opening. Functional, but lacking style. Imagine replacing that with chrome or stainless trim. Overall, this one can be polished up to be a head turner for not much dough. Is it missing a hardtop? I'm with Anonymous. There are some 1950s/60s Ferrari-esque things happening here. I like that. Car needs to be cleaned up (style wise) and simplified, as Anon suggests. The side profile has got to change, as well as the hood. As much as I'm a fan of removing bumpers, I think this car needs them (eeny weeny Euro bumpers). And a taller windscreen. Def some body work, but there are some pretty nice things going on here. Would make a one of a kind ride that had a great story behind it (provided you're not from the purebred school of automobilia).